SC Personal Injury Attorney Dirk J. Derrick Attorney Dirk J. Derrick founded The Derrick Law Firm in 1991. Since then, he has served the state of South Carolina and its visitors by practicing personal injury law. Dirk J. Derrick was born in Myrtle Beach, South Carolina in 1960. He grew up in Conway. His first job was at the age of 6 as a farmhand on his grandfather's tobacco farm in rural Horry County. At age 9, he purchased his first vehicle when his grandfather sold him a 1960 pickup truck for the amount Dirk earned that week, $28.00. Dirk credits hot, humid summer days in the tobacco fields as his inspiration to excel in school and get a good education. He grew up in a house with his parents, Julius and Polly Derrick, and three sisters. His father was a high school teacher and football coach who had been co-captain of the 1957 South Carolina Gamecock football team and drafted by the New York Giants. Coach Derrick was very competitive and his children were raised to compete to win in anything they pursue. Everything was a competition including who could be the most productive in their summertime farming jobs, who could make the best grades in school, and who could win a particular athletic competition. This characteristic probably explains why all four children attended college and participated in college athletics. Dirk earned a football scholarship to Wofford College where he played for four years. After graduating, he coached college football at East Tennessee State University for one year where he met his wife, Michelle Garrity. They were married in 1985, the same year Dirk began law school at the University of South Carolina. He graduated in 1987 and began practicing in Horry County in 1988. Due to early success in the courtroom, Dirk worked his way into a partnership after just three years. In 1991, he left the partnership and established The Derrick Law Firm. 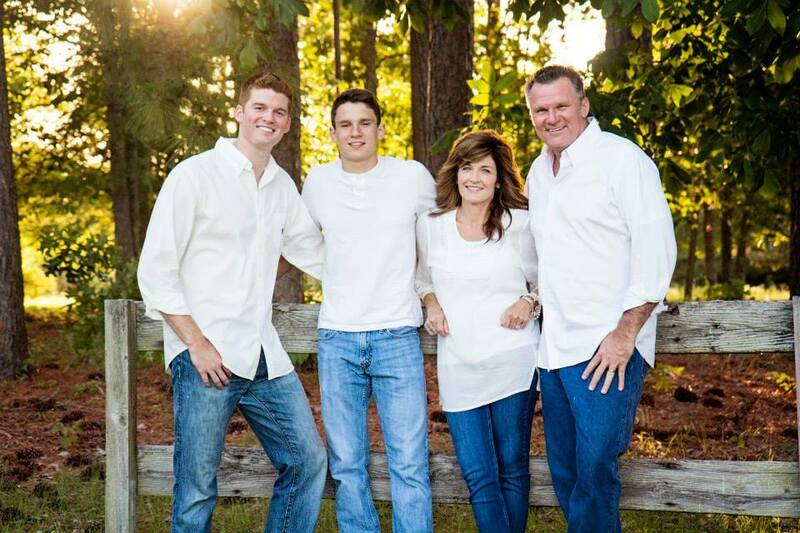 He and his wife, Michelle, are very involved with their two sons, Dakota and Peyton. Dakota is a practicing attorney at The Derrick Law Firm and Peyton plays football at Appalachian State University. Dirk is also very involved with his community. He is a founding member and elder of The Rock, Conway's Community Church, which began in 2005 as a ministry for young people, people who have never gone to church, or people who have no interest in attending traditional churches. He is also involved with the Fellowship of Christian Athletes and has been so for 47 years since he first attended an FCA Camp in Black Mountain, NC. He has been a member of the Horry County FCA Adult Chapter and has also served on the Coastal Area FCA Board in the past. Dirk supports the Children's Mentoring Program of Horry County, formerly Big Brothers/Big Sisters of Horry County and was a board member for 14 years. His father and mother have been the co-directors of the program since 1989. The Derrick Law Firm sponsored the Derrick Law Firm Carolinas Kickoff Clash from 2012-2015. This is an interstate football weekend matching South Carolina teams versus North Carolina teams. The Derrick Law Firm also sponsored the annual Run for the Children 5K Race that began in 2013 and ran through 2016. The race ran through historic downtown Conway, and all funds raised went to the Children's Mentoring Program of Horry County. Dirk has focused his practice on personal injury, wrongful death, and worker's compensation cases since he graduated from law school in 1987. He has owned his own practice since 1991 and has office locations in Conway, Myrtle Beach, North Myrtle Beach, Charleston, North Charleston, Mt. Pleasant, and Columbia, South Carolina. He has also been voted the Best Attorney for the Horry Independent's Reader's Choice Award for the years 2014-2018. From 2016-2018, he was voted Best Attorney for the Myrtle Beach Herald Reader's Choice Award. "From the moment I walked into the Derrick Law firm ,I felt comfortable. I wasn't sure if I even had a case. Mr. Derrick listened and assured me he would do whatever he could. I was informed every step of the way. When I had questions, they were answered honestly and in a way that I understood. I really appreciated every person in that office including his assistant and front office workers. They were all friendly,considerate and professional. I highly recommend this law firm."